It's hard to excuse the reconception of the eleven or twelve-year-old Pocahontas...as a statuesque supermodel, especially as kids don't need their stories to be hung on romance to deem them, err, shapely. 81 min. Walt Disney Pictures. Directors: Mike Gabriel, Diane Eskenazi. Cast: Mel Gibson, Linda Hunt, Christian Bale. Ah, Pocahontas. The film that asks the musical question "Have you ever heard the wolf cry to the blue corn moon?" Well, have ya, punk? I kid Pocahontas, which found Disney at something close to its height of straining for political correctness even as it happily simplified history. The 1995 animated musical is the Lies My Teacher Told Me version of American history, but at least it's mostly concerned with the benign end of promoting cross-cultural understanding. The wee-est, of course, won't know the difference between Pocahontas and The Princess and the Frog, unless parents set them straight (which would be a good idea), so perhaps writers Carl Binder, Susannah Grant (Erin Brockovich), and Philip LaZebnik deserve a bit of slack in that regard as they nominally retell the 1607 encounter between Powhatan native Americans and Virginia Company settlers intent on establishing an English colonial settlement (which would become Jamestown, Virginia). Powhatan princess. But it's hard to excuse the reconception of the eleven or twelve-year-old Pocahontas (Irene Bedard; singing voice of Judy Kuhn) as a statuesque supermodel, especially as kids don't need their stories to be hung on romance to deem them, err, shapely. But the demands of modern narrative (and persistent legend) insist upon Pocahontas making goo-goo eyes at, and kissy faces with, Englishman John Smith (Mel Gibson) when worlds collide in the "New World." Meanwhile, Pocahontas' people—including her father Chief Powhatan (Russell Means) and brave warrior Kocoum (James Apaumut Fall)—and the Virginia Company—including embodiment of bloated evil Governor Ratcliffe (David Ogden Stiers) and callow Thomas (Christian Bale)—both go on the defensive in anticipation of likely battle between the natives and the unwelcome colonists. Like Romeo and Juliet, Pocahontas and John Smith tentatively circle each other, bond, and then represent a hope for love and conciliation rather than hatred and war. If this will happen, Pocahontas will first have to school Smith in the mystical ways of Mother Earth, as embodied by talking tree Mother Willow (Linda Hunt), and, via the Oscar-winning Best Original Song "Colors of the Wind," dress him down for his imperialist mindset: "You think I'm an ignorant savage/And you've been so many places/I guess it must be so/But still I cannot see/If the savage one is me/Now can there be so much that you don't know?" Nominally, Pocahontas does function: though simplistic, the characters are given clear motivations and the plot builds to a stirring climax. The collaboration of composer Alan Menken and lyricist Stephen Schwartz doesn't yield a ton of memorable music, but it's above average for a children's movie, and the animation is pretty beautiful as a dreamy visualization of nature—dreamy, that is, except for the heroine's straight-from-Disney-central-casting cartoony animal friends: raccoon Meeko (John Kassir) and hummingbird Flit (Frank Welker). There's some small danger kids may find Pocahontas as pokey as adults will, but not much at a run time of 81 minutes: the difference is more likely to be noticed in how often the young'uns will clamor for a repeat viewing (my guess: not often). As for the straight-to-video Pocahontas II: Journey to a New World, Bedard, Kuhn, Stiers, Hunt, Means, Kassir and Welker return to duty, but the movie is awfully clunky and hardly more historically valid, despite moving on to Pocahontas' relationship with John Rolfe (Billy Zane). We also get five ho-hum songs, Jean Stapleton doing her best Beauty and the Beast-era Angela Lansbury, and Donal Gibson doing his best big-brother Mel as John Smith. As awkward complement to another romance with a white guy, Pocahontas II strikes familiar notes of how the true "savages" are the Englishmen like Ratcliffe who want to impose their culture and will on other peoples and nature, but in the end, the princess gives herself over to an Englishman and literally drifts away in the wrong direction of history. 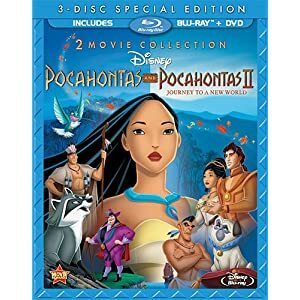 Disney gives Pocahontas splendid A/V treatment and a mostly satisfying special edition in its Blu-ray debut as part of the Pocahontas and Pocahontas II: Journey to a New World 2-Movie Collection. What's immediately most striking about the picture quality are the beautifully saturated pastels, more vibrant than ever before on home video. Banding is pretty much a given for this kind of modern animation, but other than that, Pocahontas gets a rock-solid transfer with beautiful detail, complemented by a note-perfect DTS-HD Master Audio 5.1 surround mix that especially impresses with its immersive use of rear-channels for ambience and effects. Pocahontas II will, I'm sure, never look or sound better than this, as it's granted a tight transfer and its own DTS-HD Master Audio 5.1 surround mix. It's unfortunate that Disney didn't see fit to follow its own lead from the 10th Anniversary Edition DVD by including an option to view the feature with restored song "If I Never Knew You"; the song appears on the disc (mostly, anyway; the brief reprise doesn't make it onto Blu-ray) in the bonus features, but not including a seamless-branching option was a mistake. Otherwise, bonus features impress, including the 2005 audio commentary by co-directors Eric Goldberg and Mike Gabriel, and producer James Pentecost, in which the filmmakers provide wall-to-wall information about their intentions, the film's origins, animation technique, and historical fidelity or lack thereof, among other topics. The fascinating new featurette "Drawing Inspiration: The Lost Story of Hiawatha" (11:49, HD) discusses an abandoned Disney animated film from the late '40s that would have adapted Henry Wadsworth Longfellow's epic poem "The Song of Hiawatha". Animation historian Charles Solomon (author of The Disney That Never Was) and Goldberg tell the tale and present archival storyboards. The fully-animated deleted song "If I Never Knew You" (4:51, HD) comes with a new introduction by Goldberg and the original snippet (optional) of 2005 commentary by Goldberg, Gabriel, and Pentecost. "The Music of Pocahontas" (7:05, SD) checks in with Alan Menken, Stephen Schwartz, Judy Kuhn (seen at the mic recording vocals) and more about, y'know, the music of Pocahontas. Nine "Deleted Scenes" (15:29, SD) remain fascinating (including as they do musical snips), though it's a bummer they're still in DVD-style standard def. The 1937 Silly Symphonies short "Little Hiawatha" (9:11, SD) likewise remains in standard defintion. There are further extras, but only accessible via BD-Live, where you can delve into Disney's Virtual Vault, and the Pocahontas II DVD, which retains the "Have It Read to You" DVD storybook feature (6:10, SD). All site content © 2000-2019 Peter Canavese. Page generated at 04/18/2019 07:24:30AM.